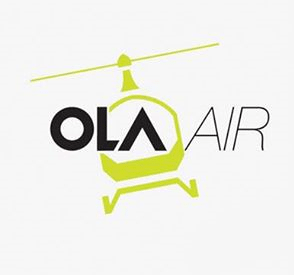 Introducing Ola Air, a revolutionary service in the sky from Ola. Now our customers can book a chopper ride in a click, from the Ola app just like booking a cab or an auto. For just Rs. 499 per hour! Visit www.olaair.com to know more. The possibilities are endless up there! Ola introduces ola ride with helicopter yes all are thinking about april fool but ola make a revolutionary change in transportation . Introducing Ola Air, a revolutionary service in the sky from Ola. Say Ola to future of taxi service that defies gravity. Your Ola app will transform the way you travel, forever. Now our customers can book a chopper ride in just one click, from the Ola app just like booking a cab or an auto! For just Rs.499 per hour!. Hungry for more? Now Pre-book a meal for your chopper ride. Pick your favourites from your Ola café menu. Feel your travel worries disappearing into thin air. With no traffic, no crowd but a lot of style 24/7. Book a chopper ride for just Rs. 499 per hour! No more haggling or hidden charges in the night. Is this service available in hyderabad?? Please tell us the simple way to contact Ola Air for chopper booking and availing services . We have our own Helipad . how to contact ola air for chopper bookiing services is it in bangalore city and coimbatore city.I am your regular customer priya leonraj.